With more and more people turning to naturally sourced bedding options, a wool mattress topper is becoming increasingly popular. While memory foam options are still around, and some are organic, there is nothing more natural than a wool topper. However, like with any type of bedding, there is a huge array of options available for anyone looking for a new topper. Here are our top picks for the best wool mattress topper. We tell you what makes them great, and how they stack up against the others. Holy Lamb Organics is a company that prides themselves on their naturally sourced wool and eco-friendly products. According to them, research shows that sleeping on a natural surface slows your heart rate and allows you to get a deeper sleep. They offer two models, the Deep Sleep and the Ultimate. We prefer the Deep Sleep model, as it has a good amount of cushion without feeling like you are stuck within the fluff of the wool. Holy Lamb Organics makes all their products within the United States, and their wool is sourced from a sustainable wool program on the west coast. The cover of the topper is organic cotton, so you can have peace of mind while you sleep comfortably. 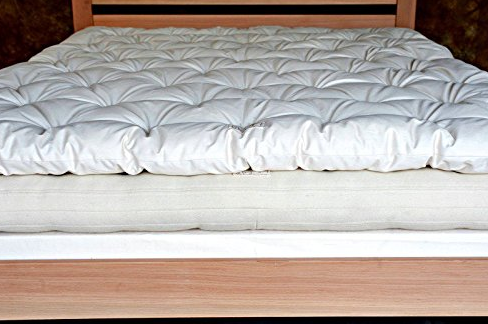 The topper can be anywhere from 1 and a half to 2 inches thick on the Deep Sleep model, which is a perfect amount of softness without feeling stuck within the cloud. 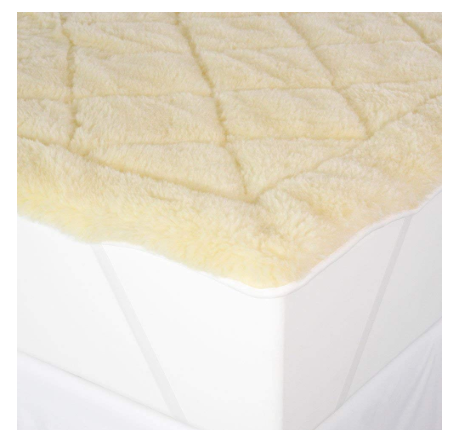 As with most wool mattress toppers, the Deep Sleep from Holy Lamb Organics offers temperature regulation capabilities to keep you cool in hot months and warm in cold months, by absorbing moisture as well as retaining body warmth to keep you comfortable. Their eco-wool material is durable and has a long lifespan. This particular topper is not machine-washable, and it can only be spot cleaned. This can be inconvenient for some, as wool can occasionally retain odors from body heat or whatever is in the air. It is somewhat expensive in comparison to other toppers, though definitely not the most expensive one out there. With wool toppers, including this one, there is minimal motion isolation, so if you sleep with a partner and are easily disturbed, this may not be the one for you. 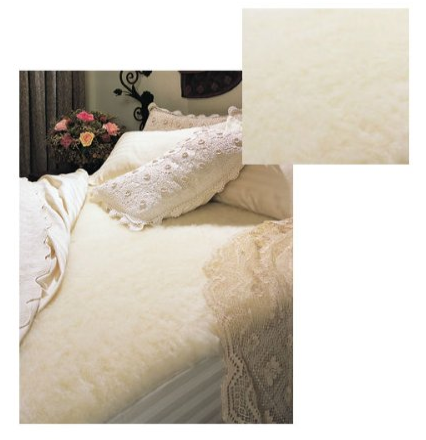 The Snuggle Mate from Shepherd’s Dream has a relatively high satisfaction rate from customers. It is thicker than the Deep Sleep model and made from eco-wool. For those who enjoy a fluffier feeling, the Snuggle Mate is 3 inches thick and topped with a cotton sateen that is incredibly soft. It is relatively lightweight for its composition, with the largest size available (the Eastern King) weighing in just under 20 pounds. 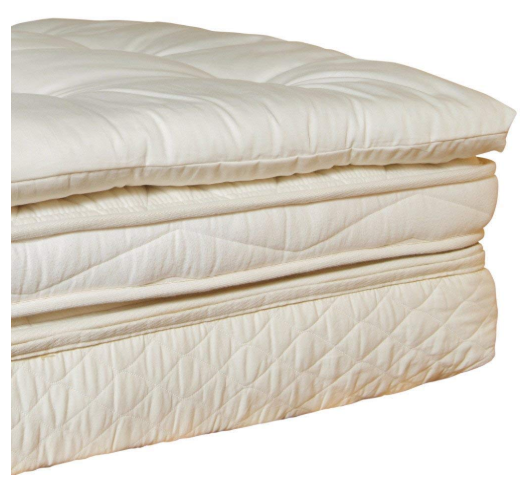 It is free of chemicals that are present in synthetic mattress toppers. It has great temperature regulating abilities, whether you sleep hot or cold – the wool will help keep you comfortable and balanced. It is on the more expensive end of the scale in terms of wool mattress toppers. Within the first 6 months of regular use, the topper will compress and be less fluffy, and some previous customers have complained that the compression is uneven. It can be machine washed, but not frequently – it may retain odors, so you need to be careful about how often you wash it. The WBC, or Wool Bed Company, was started by a woman in Wisconsin who was tired of uncomfortable sleeping arrangements. Their blend and production of wool products have received its own patent, and their mattresses and toppers are some of the best out there. The standard mattress topper has the right amount of cushion without being overwhelming and has all the right benefits. It is 4 inches thick, and when accounting for compression, still allows for a lovely plush feeling when laying down. The wool is certified Eco-Pure, so it is hypoallergenic and clean, as well as produced in an eco-friendly manner. Both the wool and the cotton cover are 100% organic and toxin-free, which is a huge benefit. The WBC method of fashioning products makes it great for people with joint pain or arthritis. Reviews have stated that the customer service with this company is less than stellar, and it can be difficult to get potential issues resolved. The company is somewhat new and small, so some things may be sort of “trial and error”. There does not appear to be any kind of warranty available or at least one that will be honored. 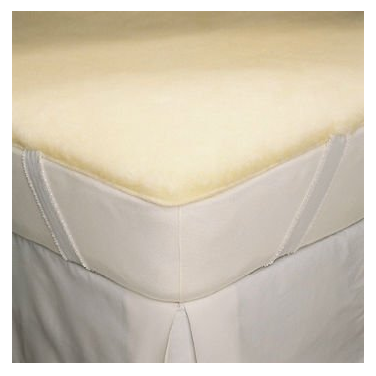 The Perfect Fit Cool Wool topper is one of the cheaper models on the market, and still has a delightful cushion and all the usual benefits that come with a wool mattress topper. It has good reviews on various websites, and customers seem to be pleased. This cover is reversible – one side is soft Australian wool and the other is a smooth cotton cover, so you have your choice in a cushion. This topper is washable, so you do not need to worry about the potential for odor retention like with other wool toppers. This topper has great temperature regulation, mostly due to the reversible options. The wool side is great for colder months or for those who prefer a cool home, as it will retain heat and keep you warm. The cotton side will still benefit from the moisture wicking capabilities of the wool but will keep your body cool. It is 2 inches thick, which is a great thickness for people looking for a bit of cushion but not a cloud. There is a layer of polyester within this topper, which many people do not like. Some have even experienced excess heat retention because of it. It seems to only come in three sizes – full, queen, or king. The polyester is not the only “non-wool” material, as the topper does contain some down to create the softness of the cover. The SnugFleece SnugSoft collection has multiple wool mattress toppers available in various thickness levels, and each one has its benefits and drawbacks. The Deluxe model is the thinnest of the SnugSoft collection at only 1 inch thick, but it is a great choice for those who do not need a lot of cushioning but still want the comfort and benefits of wool mattress toppers. The Deluxe is perfectly able to handle machine washing due to the way it is constructed – there is a wool layer on top of the durable poly thread that holds the topper together and creates a seal that allows for machine washing. As stated above, it is one inch thick, which is great for those who want a wool topper but do not want the “fluff”. It is made from 100% American virgin wool. Like the others, it has great temperature regulation capabilities. All wool covers compress, so if you want a little extra cushioning, the Deluxe may be too thin for your needs. Some customers complained that it smelled when they first received it, most likely because the wool is organic. Past customers have complained that their topper was not an inch, even after fluffing. Organic Textiles, as the name suggests, uses mainly organic and eco-friendly materials in their products. 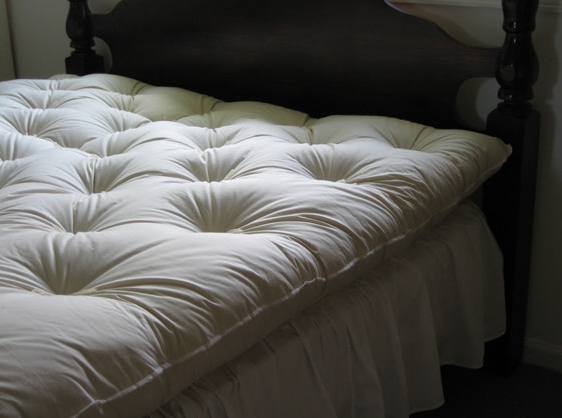 The result is a natural and comforting experience for those who use their mattress toppers. In general, customers have been highly satisfied with Organic Textiles. 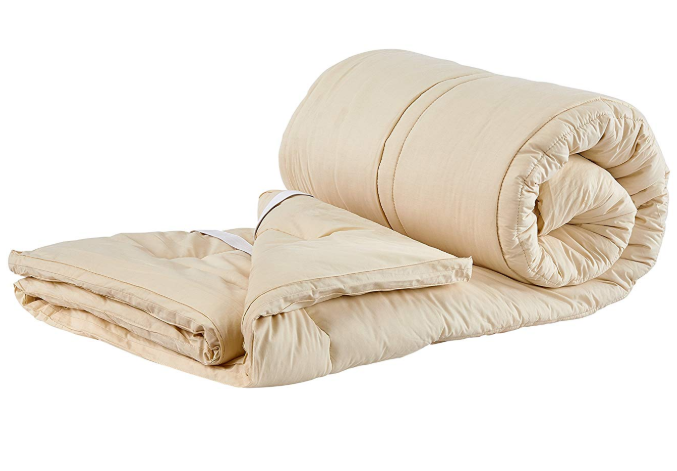 The wool is 100% organic Australian wool, and the covering is a 100% white silky sateen cotton cover. Additionally, it gives you a soft, luxurious sensation. The wool and the organic nature of the topper make it hypo-allergenic and very clean. 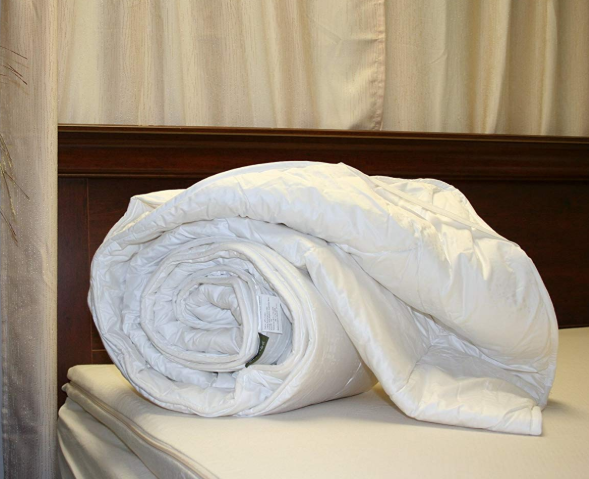 It comes in a wide range of sizes, all of which include straps to keep the topper secure under the sheets. Sizes are twin, extra-long twin, full, queen, king, and California king. It is more towards the affordable end of the average price for wool toppers. Though the website claims that this topper is machine washable, many customers have had terrible experiences with washing, or at least drying. The topper is line-dry only and needs to be washed very carefully. In some cases, the topper has shrunk after the very first wash but does not shrink more from there. Customers have complained about a smell lingering for a while after initially opening it, but it does eventually go away. Like the SnugSoft Deluxe, the SnugFleece Elite has a lot working for it. It is incredibly comfortable and soft, with a thickness of 1 and a half inches, their thickest in the collection. At 1.5” thick, it is a great thickness for those who want a smooth, even surface without the extra fluff of some wool toppers. It is available for nearly any bed size, and (according to reviews) fits very well and does not shift. It is machine washable, just like the SnugSoft Deluxe. Customers say it is incredibly soft and maintains its fluffiness even once it is compressed. It gives you a continually soft sleeping experience. The mattress does contain a layer of polyester, which some customers complain negates the temperature regulation of the wool. Some people have complained that it is less than ideal for those who sleep on their sides. However, this is not frequent. It is a tad more expensive than some other models of similar size. This topper is number one for a lot of reasons. It is made of merino wool, which is known for some of the best temperature regulation out there. It works wonders for those who experience either trouble sleeping because of pain or because of temperature. Overall, it is an incredibly pleasant mattress topper. It is made entirely of merino wool, which does everything typical wool does, but better. myMerino wool is known for being better with temperature regulation, comfort, weight, and durability. It is the same softness with a better functionality. The wool and the cotton cover are both organic and hypoallergenic. The thickness is an inch and a half, which is ideal for a soft cushion without the excess plush, and the compression does not affect the sensation very much. Their toppers are available in an ivory color, which is eye-catching and lovely. There will be a smell to the topper upon initial opening – but it will fade after a few days. An inch and a half may not be enough cushion for those wanting a plush sensation, particularly after the wool compresses. Occasionally, people have complained of excessive shedding of the wool fibers. However, this does not appear to be a common occurrence. 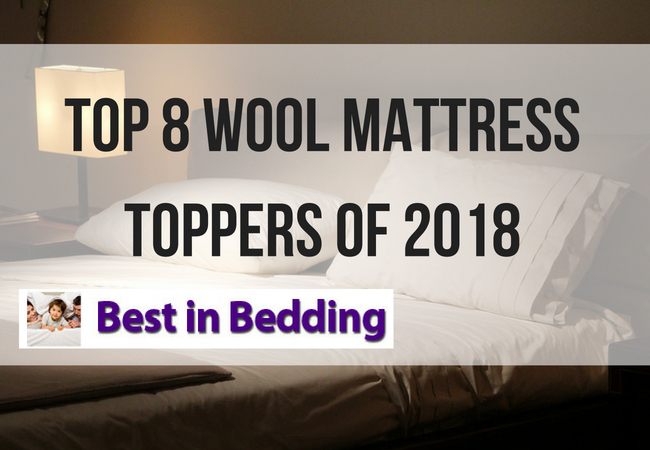 Our choice for the best wool mattress topper of 2018 is definitely the Sleep & Beyond myMerino wool mattress topper. However, all of the toppers on the list above have their benefits. In the end, it comes down to your taste. If you want something very plush, the myMerino may not be right for you. However, if you do not need an extra plush topper, the myMerino is the best choice all around. Finally, whatever your tastes and choices, these mattress toppers have been satisfying customers, and the advantages of wool versus memory foam speak for themselves. If it is a comfortable night’s sleep you are looking for, buy our #1 recommended myMerino mattress topper of 2018 today! Featured image: CC BY 2.0, Esther Max via https://www.flickr.com, with text, banner, and logo added. « Comparing Leesa vs. Casper Mattresses – Which One Is Better?